Small marketing budgets, not understanding your target patients, and other constraints prevent many urgent care centers from achieving success. As a leading urgent care marketing agency, we are fully aware of the different challenges and constraints of marketing an urgent care practice. During our long association with many urgent care providers, we learned the best ways to market an urgent care practice, even amid all the hurdles. Listening to patients and taking steps to improve your care experience will get your patients to talk about you, eventually referring you to their friends and family. For that, you’ll need to create a welcoming environment at your clinic. A neutral décor, background music, and friendly staff members will work significantly in fostering positive feelings among your patients about your practice. Ensure that your staff members are interacting with patients and communicating the expected wait times, while also explaining the process before and after the visit. As the internet is now the first source of information for patients, you’ll need to elevate your practice’s online presence to have a strong online influence. Create a responsive website (fits on any-sized screen) that is attractive, easy to navigate, features great content, and is search engine and mobile optimized. List your practice on important local online directories such as Google My Business, Yelp, Doctor.com, etc., so it can rank for search terms like “urgent care near me” that are frequently used by patients searching from the locality. Don’t forget social media! Having a Facebook page of your practice will help you get higher recognition from your local community, and improve your local search rankings. Studies suggest that satisfied patients are less likely to review than unhappy & dissatisfied patients, who tend to be more vocal even though they’re not in the majority. This makes your practice suffer even when you have a handful of happy patients and just a few unhappy ones. With an online reputation management system in place, you can make the review writing and submitting process easy, fun, and exciting. An ORM tool will encourage happy patients to write and share their positive experiences online more frequently, in just a few clicks. Also, the system will prevent negative reviews from being posted online and will help you deal with patients’ concerns more immediately, so that they know they’re being listened to. Like any other healthcare practice, urgent care centers also need a strong base of returning patients to be successful. Ask your patients to refer you to their friends, family, neighbors, and colleagues. Provide two business cards to patients; one for the patient and the other they can use to refer you. Also, focus on a proper online referral marketing strategy. Target the right audience with unique and thought-provoking healthcare content such as newsletters, e-flyers, blogs, reports, infographics, video testimonials, etc. This will help you establish yourself as the #1 choice in any referral decision. Another way to market your urgent care practice is partnering with your business neighbors to gain third-party referrals from them. Local businesses see a lot of customers each day who are likely to listen to them. It’s a fact that people believe in word-of-mouth coming from a trusted person or source. As pointed out by the Journal of Urgent Care Medicine, urgent care centers rarely utilize local media outreach for pitching compelling medical stories. Make friends with editors at some local media outlets such as newspapers, radio, and TV news channels, or popular blogs. Submit compelling medical story ideas based on services your urgent care center offers. Slowly, it will make you a prolific influencer in your industry. Local reporters will start using your urgent care brand as the go-to-source for related medical stories. That way, you’ll gain widespread local media coverage that will help you get enough free publicity to propel your practice forward in your community. As a community service provider, you will need to build a relationship with people if you want your practice to succeed. This can be achieved by letting the community members feel your presence. One of the best ways to do that is sponsoring or organizing local community events. You can set a booth and provide information or first aid services to the participants, and/or sponsor your urgent care brand name on the jersey of the participants for brand marketing benefits. The idea is to be more visible in your community so you’ll never have to worry about acquiring new patients. 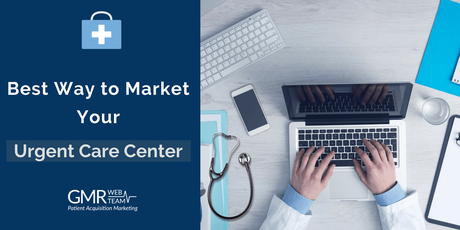 Follow these best ways to market your urgent care practice so that you never have to worry about your patient base. Learn more about our urgent care marketing.